An annual survey led by researchers at William & Mary's Virginia Institute of Marine Science mapped an estimated 104,843 acres of underwater grasses in Chesapeake Bay in 2017, the highest amount ever recorded and the third consecutive year of record-breaking abundance. It is also the first time in the history of VIMS' SAV Monitoring and Restoration Program—established in 1979—that the total abundance of this critical habitat has surpassed 100,000 acres. SAV stands for submerged aquatic vegetation. The 2017 total is 14,843 acres greater than the Chesapeake Bay Program's 2017 restoration target and 57 percent of the ultimate restoration goal adopted in the Chesapeake Bay Watershed Agreement. Notably, a 5 percent increase in underwater grass abundance was observed just from 2016 to 2017. Robert "JJ" Orth, founder and director of the SAV program at VIMS, says "2017 was quite an exciting year. First, we exceeded 100,000 acres for the first time ever in the survey, and now have three successive years of record high numbers. Second, we noted SAV in two areas of the Bay that had not seen any since 1972—near Solomons Island, Maryland, and in the upper York River in Virginia. Hopefully this trend will continue in 2018." Brooke Landry, a natural resources biologist with the Maryland Department of Natural Resources and Chair of the Chesapeake Bay Program's SAV Workgroup, echoes Orth's enthusiasm. "These latest SAV numbers show that all the hard work has been worth it," he says. "Knowing that our actions and efforts have gotten us here should provide the incentive to keep moving forward, keep cleaning up our waters. We've made progress, but we're nowhere near finished." Underwater bay grasses are critical to the bay ecosystem. They provide habitat and nursery grounds for fish and blue crabs, serve as food for animals such as turtles and waterfowl, clear the water by reducing wave action, absorb excess nutrients, and reduce shoreline erosion. 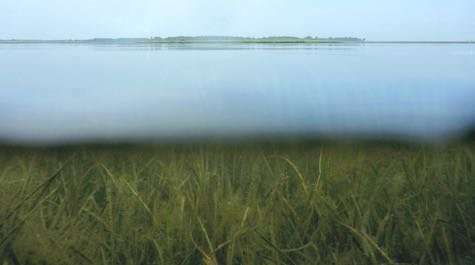 Because underwater grasses are sensitive to pollution but quick to respond to water-quality improvements, their abundance is a good indicator of Bay health. A recent article in the Proceedings of the Natural Academy of Sciences indicates that the resurgence of the Bay's underwater grasses is in part due to nutrient reductions from the Environmental Protection Agency's Total Maximum Daily Load requirements, along with conservation incentives. Orth and VIMS GIS Analyst David Wilcox attribute this year's rise in underwater grass abundance to strong increases in the very salty, moderately salty, and tidal fresh regions of the bay. The very salty region saw a sustained recovery of eelgrass, while the moderately salty region saw a continued increase in widgeon grass. Because widgeon grass is a "boom-and-bust" species whose abundance can rise and fall sharply from year to year, a widgeon-dominant spike is not guaranteed to persist in future seasons. However, in the tidal fresh region of the Bay, underwater grasses such as wild celery and water stargrass are now returning and expanding into some areas where they haven't previously been recorded. These types of grasses are less susceptible to rapid fluctuations in abundance. 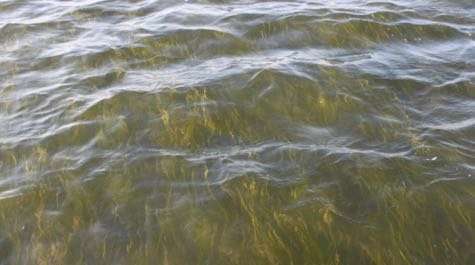 Southeast Virginia: Underwater grass abundance in the fresh and slightly salty James and Chickahominy rivers increased 186 percent between 2016 and 2017, from 577 acres to 1,651 acres. The District of Columbia: Underwater grass abundance in the Anacostia River increased 58 percent between 2016 and 2017, from 8 acres to 13 acres. Central Maryland: Underwater grass abundance in the Patapsco River increased 313 percent between 2016 and 2017, from 3 to 14 acres. Southern Maryland: Underwater grass abundance in the Lower Patuxent River increased 301 percent between 2016 and 2017, from 32 to 130 acres. Northeast Maryland: Underwater grass abundance in the Gunpowder River increased 34 percent between 2016 and 2017, from 912 acres to 1,219 acres. Underwater grass abundance in the neighboring Bush River increased 103 percent, from 62 to 126 acres. In 2017, two Maryland and two Virginia rivers surpassed their underwater grass restoration goals. These are the Northeast River and Fishing Bay in Maryland, and the Rappahannock River and the Chickahominy River in Virginia. Additionally, seven Maryland rivers, four Virginia rivers, and two District of Columbia rivers had segments that surpassed their restoration goals: the upper portion of the Big Annemessex, the upper Chester, the lower Elk, the upper Gunpowder, the upper Manokin, the mouth of the Choptank and Chesapeake & Delaware Canal in Maryland; the middle portion of the James, the upper Pamunkey, the upper Potomac, and the upper Mattaponi in Virginia; and the Anacostia and upper Potomac River in Washington, D.C.
VIMS tracks the abundance of underwater grasses as an indicator of Bay health for the Chesapeake Bay Program, the federal-state partnership established in 1983 to monitor and restore the Bay ecosystem. VIMS researchers estimate the acreage of underwater grasses through aerial surveys flown from late spring to early fall. For 2017, the VIMS team continued the practice—first introduced in 2013—of categorizing abundance using 4 different salinity zones, which are home to underwater grass communities that respond similarly to storms, drought, and other growing conditions. Reporting abundance by salinity zone makes it easier for scientists to connect changes in grass communities with changes in growing conditions through time. The 4 zones are tidal fresh, slightly salty (oligohaline), moderately salty (mesohaline), and full salinity (polyhaline).